Taking on a big kitchen project is always daunting. The project to do list seems so long! We are on week two of the One Room Challenge, and I have to say so far I am happy with the progress! Considering we have two toddlers, we've accomplished a lot in a short amount of time. I'm hoping we can keep up this pace as the timeline continues to get tighter! 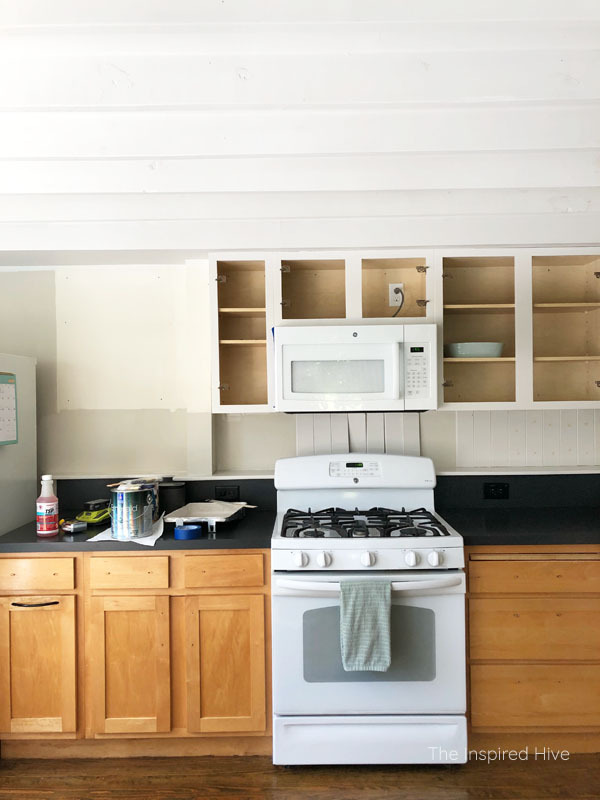 If you're just joining us, you can see all of the kitchen before photos here along with my design plans for the space. My goal is to bring some old house charm to this 1990s kitchen. 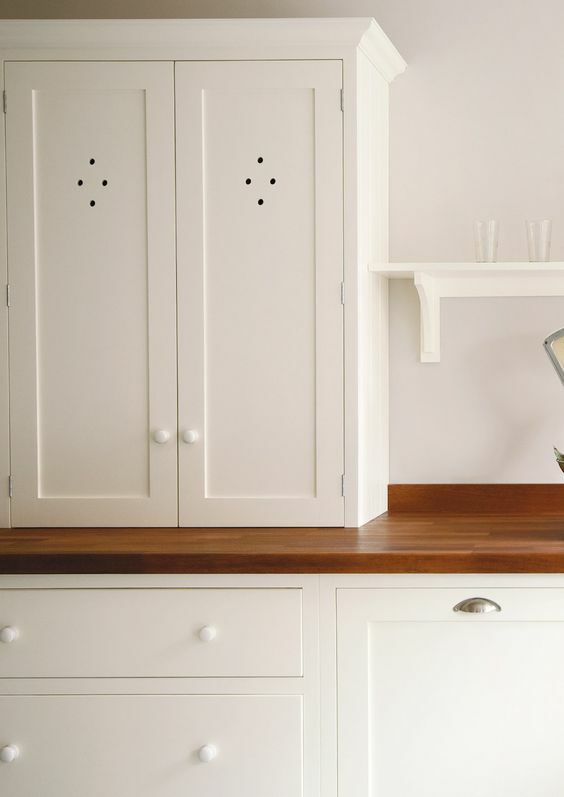 Today I'm sharing kitchen makeover progress so far plus some beautiful vintage style kitchens that inspired my design. I am honored to be collaborating with Sherwin-Williams and Kingston Brass on this project. As always, I only promote brands that I love and think you will too. First a quick glimpse above to remind you where we are starting from. And below, it might not look like there's been much progress, but I promise there has been! I have painted the entire room in my favorite Sherwin-Williams Emerald wall paint. I chose "Incredible White" which is a nice subtle greige-white. It's one step brighter than "Agreeable Gray" which is my favorite paint color for walls but too dark for the lighting in our lower level. We took out the glass cabinet and little built in shelves. I plan on wrapping that post with a faux wood beam and installing some open shelving in the open space. We removed all of the cabinet hardware, and removed the doors from the upper cabinets. The upper frames are done being painted, and I am halfway finished with the upper doors. The v-groove backsplash has been cut and partially installed. That's our big task for the coming weekend! It will continue all the way along the countertop and behind the fridge. 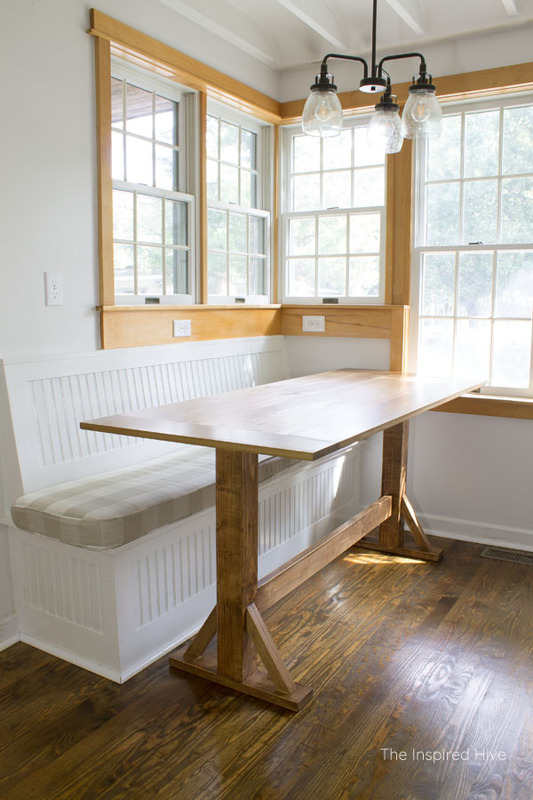 We also completed the DIY trestle table we built for the breakfast nook. I've still got work to do in this corner but it's coming along! You can see the table tutorial here. We've still got plenty to do! 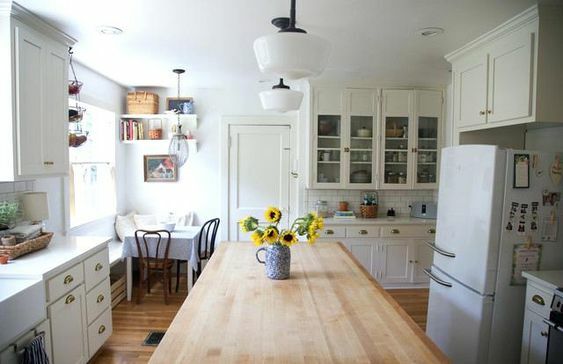 In the mean time, here are some spaces that are inspiring the vintage farmhouse kitchen feel. 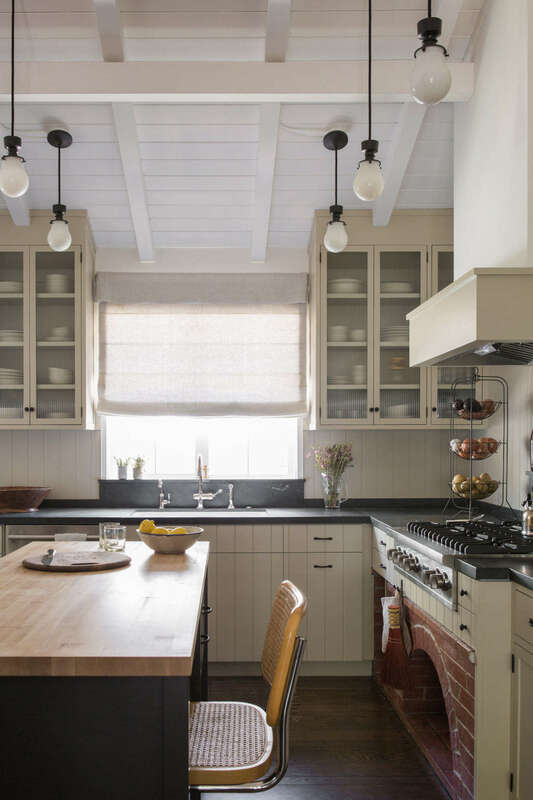 We want to give our kitchen the same charm that the rest of this old house has. 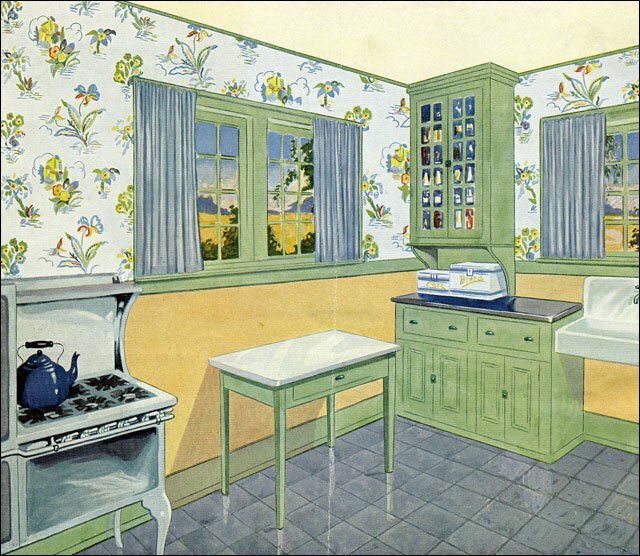 When planning the design, the first thing I did was look at real kitchens from the 1920s and 1930s. I wanted to see what design elements were in kitchens during the time period our home was built. 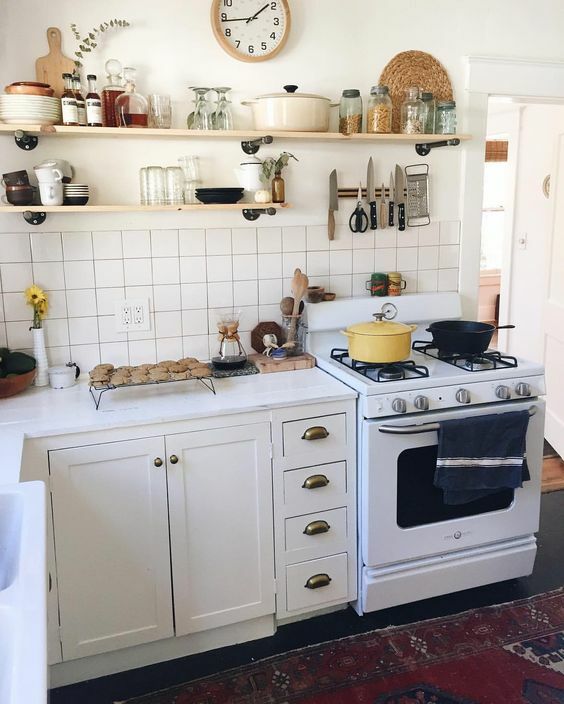 What type of cabinetry and hardware did they have? What were the popular color schemes? Any other things that stand out from the period? 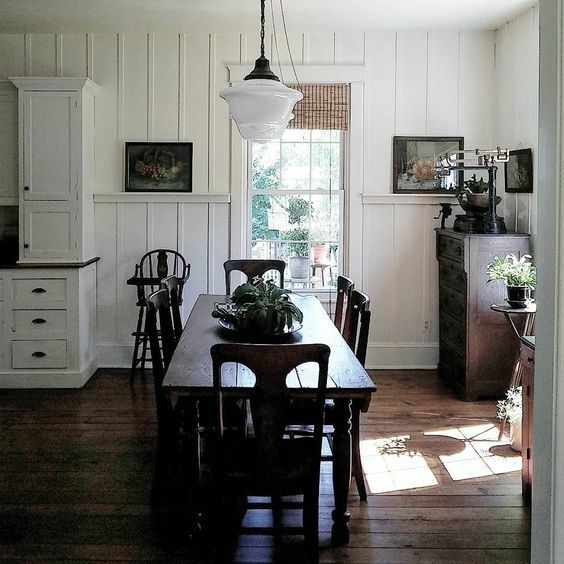 Antique Home Style has been my go to for finding old decor pictures since we moved into our 90 year old home. 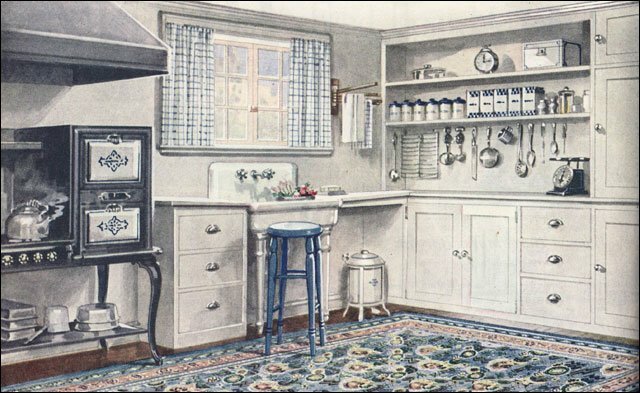 In the 1920s kitchen shown here, you can see that shaker cabinets were in style (thank goodness since that's what we have!) They have cup pulls on the drawers. There is a little bit of open shelving but still some upper cabinets. 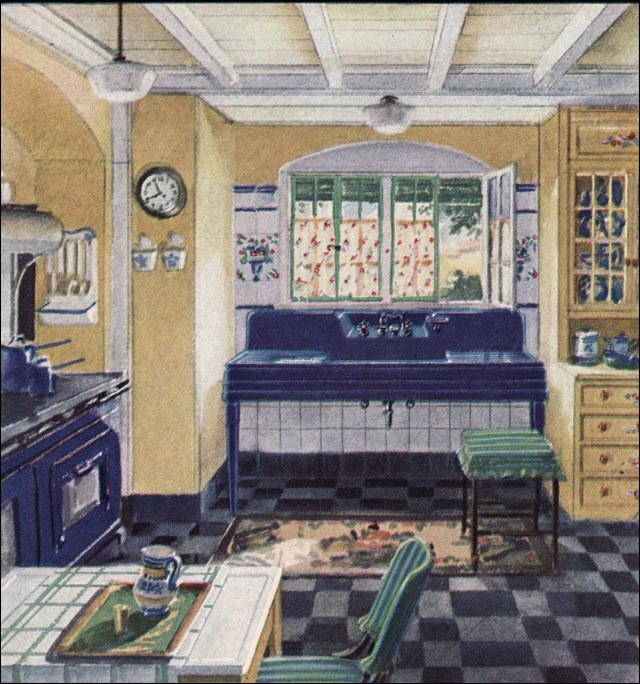 In the early 1920s, kitchens were often white with subtle color. By the end of the decade, they were embracing color and by the 1930s color was in full swing. It makes my heart happy that green was a popular shade in both the 1920s and 1930s since it's my favorite color. I can't wait to paint our lower cabinets a shade of green. Above, check out that gorgeous ceiling that is similar to ours and those schoolhouse style light fixtures. I've picked plenty of design elements from the 1920s and 1930s, but I've also added a few "vintage" elements from other time periods. I'm an old house lover but I differ from a true home preservationist in that I believe it's okay to let your home evolve. While our house was built 90 years ago, it isn't the only decade it saw. Just as we update things here and there today, our kitchen would have had updates over the years. It feels more natural to me to incorporate styles from several periods while keeping the main elements centered on the correct time period than it does to only acknowledge the late 1920s. I want it to feel like it's been well loved for 90+ years when you walk in the door. Here's a few modern kitchens with a vintage vibe that have inspired me on my quest to find that feeling. 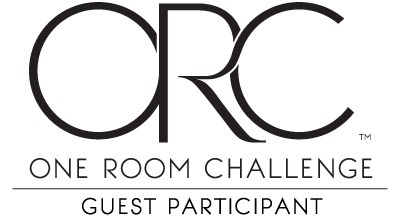 Big thanks to our One Room Challenge sponsors! 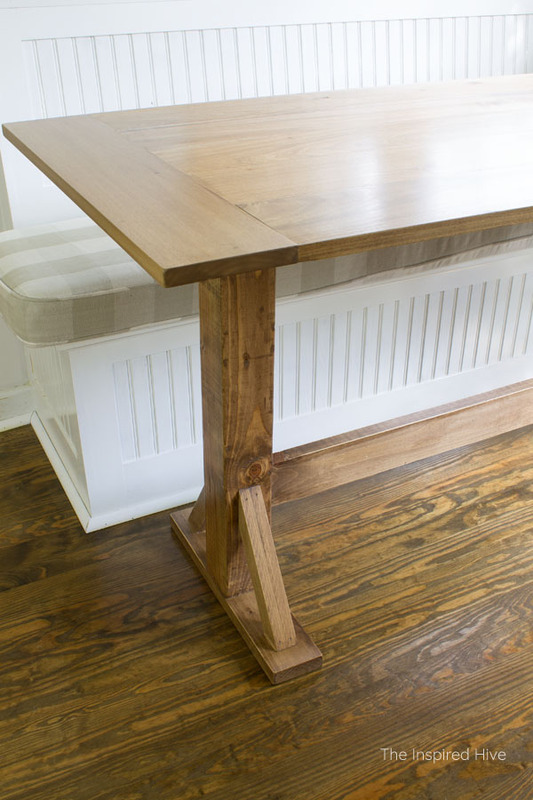 Stop by the One Room Challenge blog to see everyone else's project progress! I love the vintage inspiration photos. So cool! Thank you! Aren't those so fun??! Your table came out great. 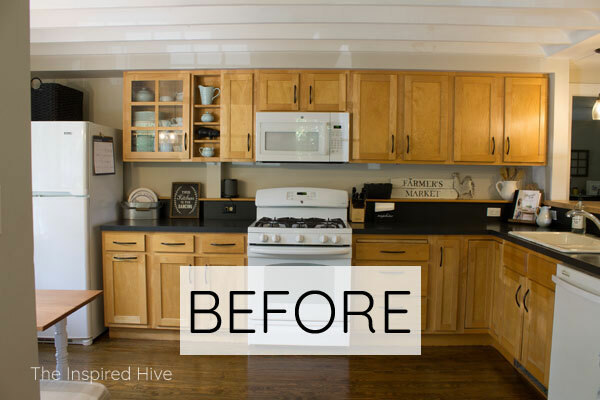 I can't wait to see how this vintage style kitchen makeover turns out. Love vintage! I adore your vintage vibe in your inspiration pics! Can't wait to see how this turns out. Great job on the table,a nd love the bench too. It's going to be fantastic! 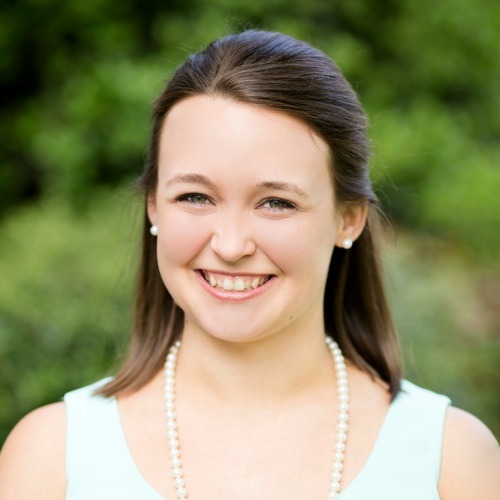 Loved the round up to see some of your inspiration. It's going to turn out soo good!!! Can't wait to see it all come together.